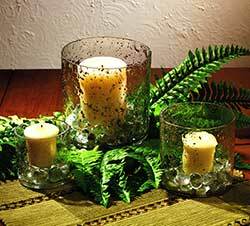 Set a table with romantic candlelight with one of our pillar candle holders, available in country, primitive, contemporary, and farmhouse styles, by Colonial Tin Works, The Hearthside Collection, Abbott, Market Street, and more! Black Diamond Mosaic Hurricane, by Tag. Handmade glass mosaic hurricane with hand-painted glass pieces in black and clear in a diamond pattern. Use as a candle holder, a vase, or just a decorative accent! Glass illuminates beautifully in candlelight. Measures 6 x 4.125 inches. Photo courtesy of Tag. Set of two glass candle holders with a beautiful mercury glass antiqued finish. 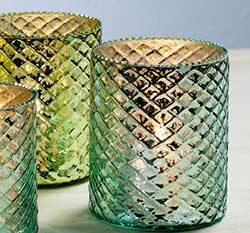 Instant centerpiece for your mantel, shelf, or table, this set of three jars are made of bubbled glass. Fairhaven Pillar Holders, by Park Designs. 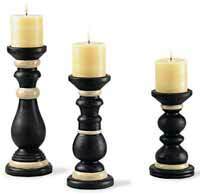 These attractive turned wood pillar holders are painted black and ivory. Set of 3 includes 1 each of the small, medium, and large pillar holder. Measures 8, 10, or 12 inches. Candles not included. 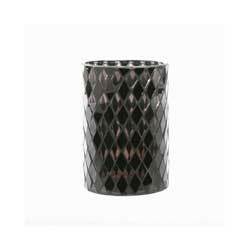 Perfect for supporting your wicked or battery grubby pillar candles, this candle holder is rustic iron with a black finish. This is for the smallest size, which stands approximately 8 inches tall. 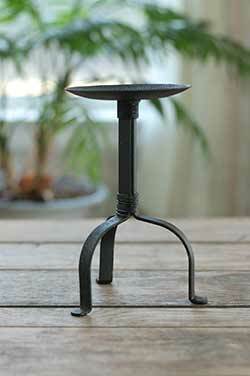 Perfect for supporting your wicked or battery grubby pillar candles, this candle holder is rustic iron with a black finish. This is for the largest size, which stands approximately 12 inches tall. 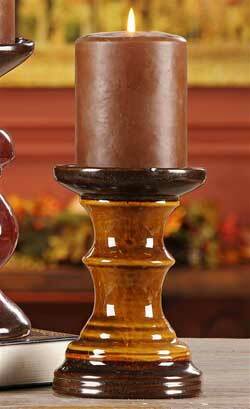 Medium Mustard Pillar Holder, by Giftcraft. Measures approx 4 x 6 inches. Made of dolomite pottery. Two other sizes also available! (Candle not included). Pillar Glass Cylinder, by Park Designs. Park's collection of glass hurricane cylinders and candle pan inserts offer a range of decor options, interchangeable for the seasons! Use the glass cylinder alone with a candle, or purchase one of the candle pans - it rests in the middle of the pan so you can burn a candle in it, and decorate the bottom with potporri, buttons, rag balls, sand and shells, seasonal candy, and more! This is for the PILLAR glass cylinder in the 9 inch size. Makes a beautiful centerpiece! 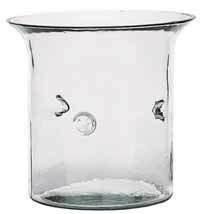 Designed to hold a 6.25 inch candle pan (sold separately from a variety of designs). Glass stands 9 inches tall, 9 inches wide at the top flared opening, and 7 inches wide at the base. 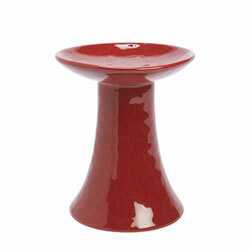 Red Stoneware Pillar Candle Holder, by Abbott. With its beautiful glazed rich red color, this versatile stoneware pillar holder works fantastically for Christmas, Valentine's Day, or every day! Stands 6 inches high. 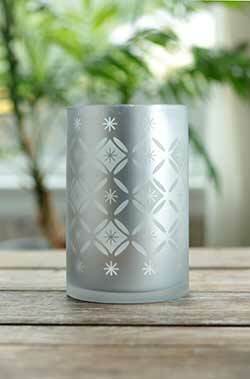 Features a metallic silver screen print of beautiful diamond snowflake design. Makes a beautiful centerpiece or mantle display! Votive Glass Cylinder, by Park Designs. Park's collection of glass hurricane cylinders and candle pan inserts offer a range of decor options, interchangeable for the seasons! Use the glass cylinder alone with a candle, or purchase one of the candle pans - it rests in the middle of the pan so you can burn a candle in it, and decorate the bottom with potporri, buttons, rag balls, sand and shells, seasonal candy, and more! 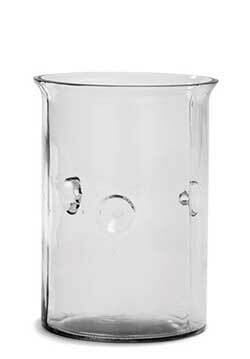 This is for the VOTIVE glass cylinder in the SMALL size, measuring 7 inches high and 5 inches in diameter.